Arto has practiced Oshana Energy-Work Method since year 2002. Practicing the Method has improved his everyday life in the form of improved health, increased energy, peace of mind and spiritual development. Arto recommends the method to all of you who are interested in spirituality, health and well being. The practices are suitable for everyone, good health or flexibility is not required. The Method is easy to learn and can be practiced at home, in the nature, and elsewhere. Arto teaches Oshana Energy-Work groups where the techniques can be learned. More information about groups' schedules is available on our meetings page. More Oshana Energy-Work classes can be found at oshana-energywork.com. 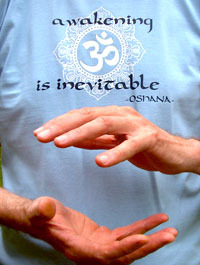 Additional information on Oshana Energy-Work Method is available at enlightenment-now.com. Oshana events can be found at enlightenment-now.com/meetings. If you can't find a suitable Oshana Energy-Work class, please contact us. Or contact Oshana Office. Arto has practiced Yoga for more than 10 years. He got his yoga guide degree in late 1990's. He has run regular yoga classes since 1999. Arto does not like to call his classes with any particular name, however the practice looks like classic Hatha yoga. The main coal of the practice is to enter and stay aware in a meditative state, rather than doing or improving physical movements or asanas. During and after the practice the body feels relaxed, the mind feels calm and peaceful. Thousands of Finns around Finland have participated in Arto's classes. He has classes mostly around southern Finland in adult education, like in Työväenopisto and Kansalaisopisto, Sport clubs and in companies for the employees. For up to date information about available courses, please see meetings. If you can't find a suitable Yoga course from our present schedule, or if you would like to start a practice in your company or elsewhere, please contact us. Blog spiritual events and more!